Joseph Browning is a lifelong artist, classically trained in drawing and painting. He is also a writer and author of various newsletters, short stories, technical papers, and a workbook on how to manage feeling dynamics. After receiving his BA degree in Illustration and spending 12 years as a professional fine arts painter and illustrator, he founded Joseph Browning Design (JBD) in 2000 to provide Graphic Design solutions to his growing number of clients needing these services. Using digital applications such as Illustrator, Photoshop, Fireworks, and Dreamweaver, along with hand-coding HTML and CSS, digital photography, and technical writing, JBD is a full service design resource specializing in helping clients graphically define their products and businesses. 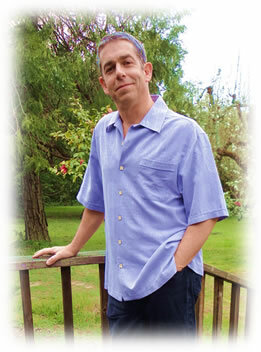 JBD is located in Sebastopol, CA and works with clients throughout Northern California and the United States. online and in print since 2000. Initial 60 minute consultations are always FREE. JBD works with clients via email, phone, or in the studio. Joseph Browning Design (JBD - formerly JB Pictures Design) excels at providing design services from concept to final product. The initial concept work is really the heart of most jobs and it holds the most value for the time put into it. The conception of the ideas to be utilized in the job go toward determining every aspect of the job. Joseph is professionally trained in Digital Graphic Design, Illustration, Drawing and Painting and can create just about anything, utilizing various techniques, styles, moods and themes in order to get the job done. For most jobs JBD can provide a "ballpark" cost estimate during the initial consultation. Some jobs get billed hourly, while others may be bid on for a total price. On all jobs, JBD works transparently with clients by providing email samples that include the date, the time spent and what exactly was created, so that over time the client comes to understand both the process and how long things take to get done. The client is always aware of how much time is being spent and therefore what the job cost is as the job evolves. This allows JBD and the client to work precisely towards finished design artwork without any guessing or assumptions. It is our job as a graphic design company to listen carefully to the client and to clearly establish with them what their needs are. JBD strives to create graphic design that both works for each client's business needs and that is aesthetically pleasing to the client and their customers. The goal of JBD is to satisfy our clients 100%. What kind of Graphic Design are you looking for? You will be contacted within 48 hours of receipt of information. All information is used for contact purposes only. 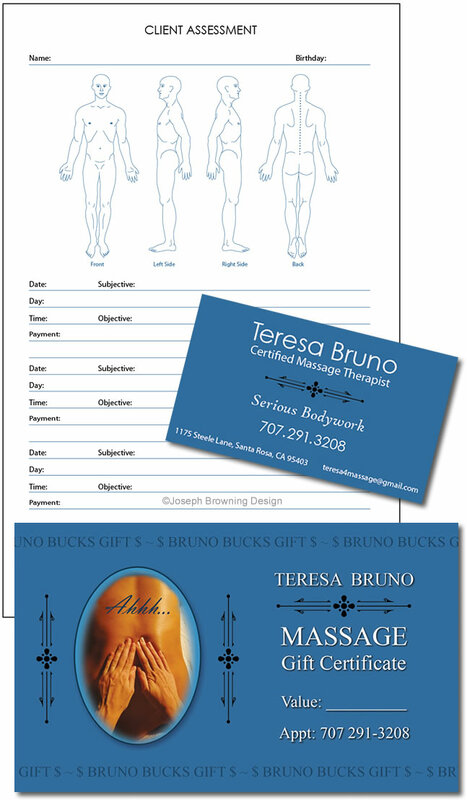 JBD and Teresa Bruno have been working together since 2012, creating and updating such things as the Client Assessment Notepads, Business Cards and the new Gift Certificates, as shown below. Working together over the years, both JBD and Teresa have gotten to know each other, and get to help each other broaden their business relationship while expanding on the client's brand. Knowing more about each other creates a working familiarity that speeds up the process of doing each new design layout. This "speeding up" process is key to ongoing working relationships as it reduces costs over time.